Blurb : Evil Grows Beneath the Earth: Why should anyone travel the cracked cobblestones of the Old Road? The fortress that once cast its shadow across the road does so no longer - some whisper that the earth swallowed the fortress whole in an age long past. Four brave adventurers resolved to discover the truth and set off down the Old Road but they never returned. 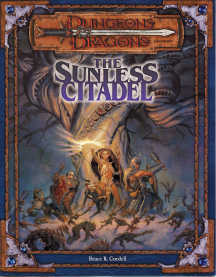 The Sunless Citadel is a stand alone adventure for the DUNGEONS & Dragons game. This carefully crafted adventure, designed to challenge 1st level D&D heroes, follows a path to a mysterious dungeon where evil has taken root, and a terrible tree and its dark shepherd plot in darkness. The Module : This is a straight forward, old fashioned dungeon bash. The layout, artwork and maps are excellent particularly the area maps are which are drawn in a semi-3D style. Hardly any time is spent with background or setting up the adventure, but none is needed and the bulk of the module is dedicated to room by room descriptions. This is very much a "Ready-to-Run" adventure, one read through and the DM can get cracking. Being this easy to run can be a double edged sword in that the gain in speed means a sacrifice of role-playing interaction opportunities. I think this is very much the case here but WoC have done a good job and it's not really noticeable in amongst the action. An appendix gives a summary of the monsters encountered and magic item details. Good Points : Good ready-to-run adventure. Great artwork and maps. Bad Points : The cover, which has the maps printed on the inside, does not separate from the rest of the module for ease of reference. Other Notes : Interestingly the blurb on the back tells you that you need the PHB, DMG and the Monster Manual, however the Monster Manual has not actually been released when the module came out. I notice that the game is designed for 4 1st level PC's, which is a departure from the traditional 6-8 format. I wonder if WoC have done any research on the average number of party members in a typical gaming group?